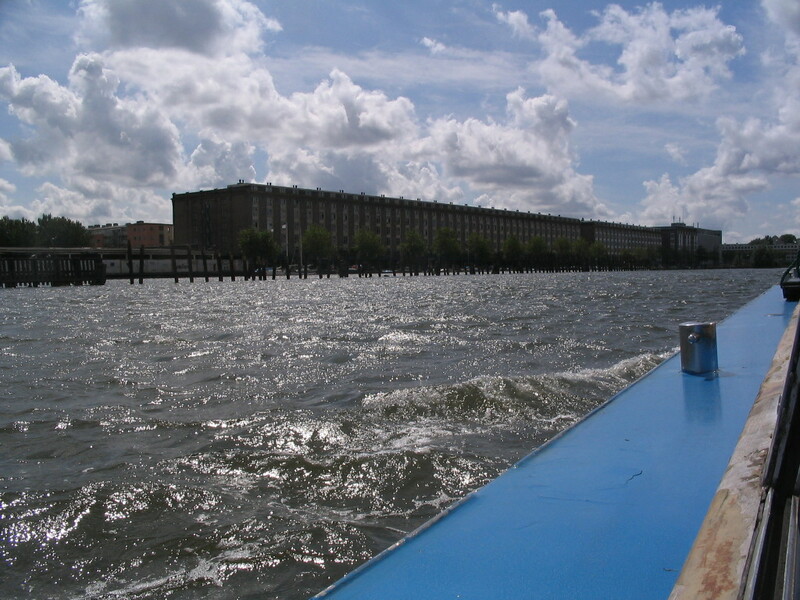 To start with, we headed out on some northern and eastern waterways, around and through harbors. 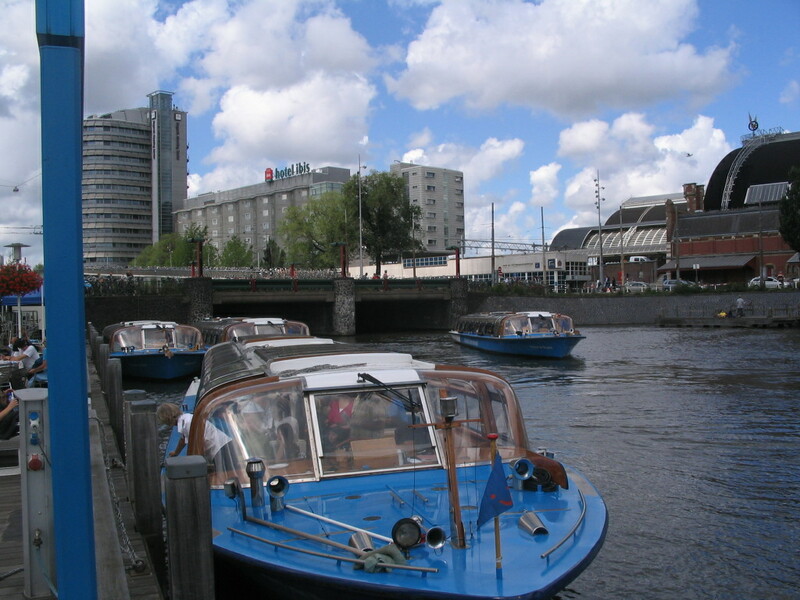 The tour boats were parked at Open Haven, just west of the Centraal Station. 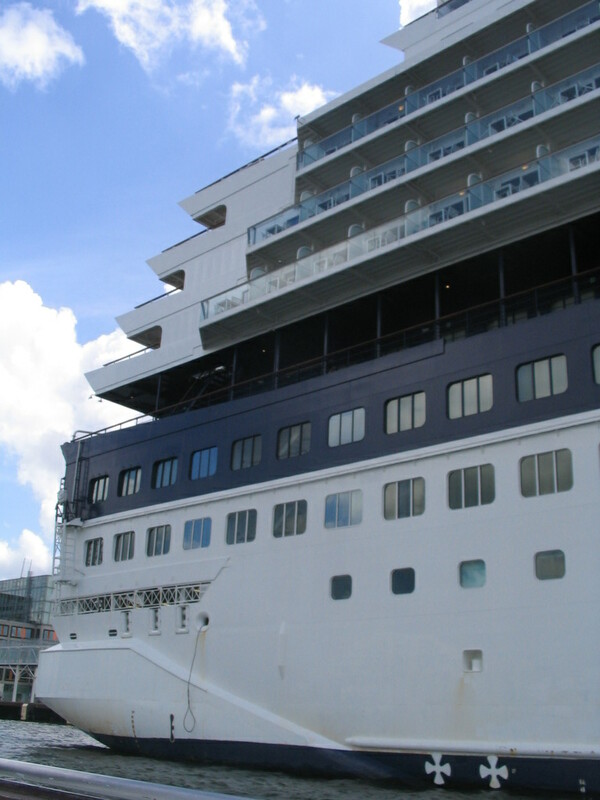 They had fully glazed roofs for optimum rubbernecking. 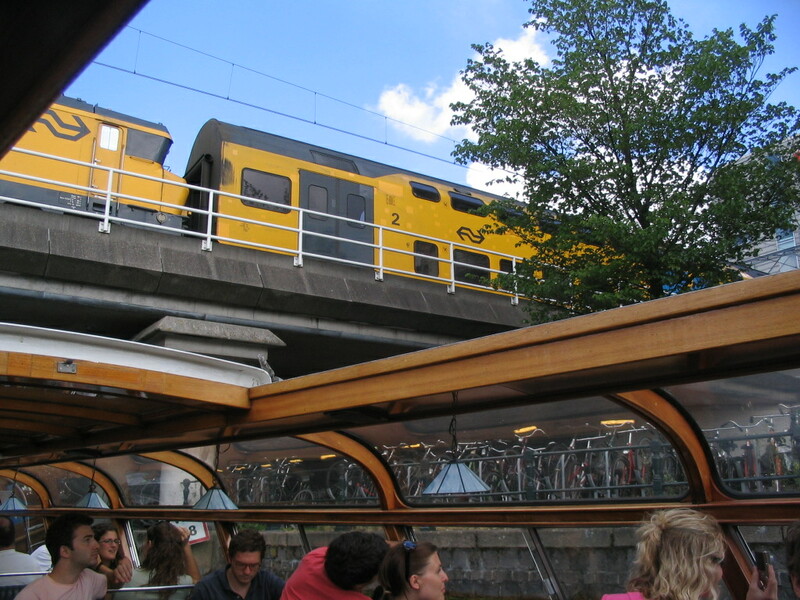 We slunk under the tracks to get out to the IJ. 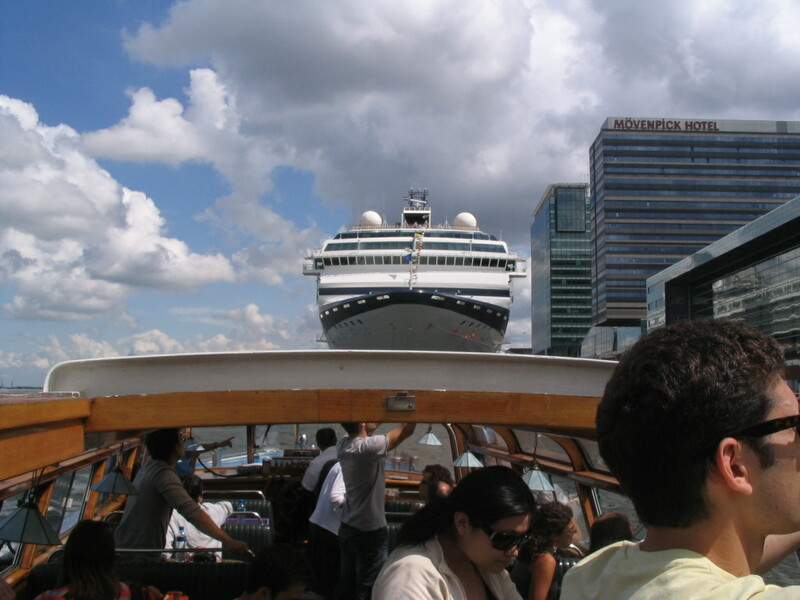 Can you find ALL THREE modes of transportation??? 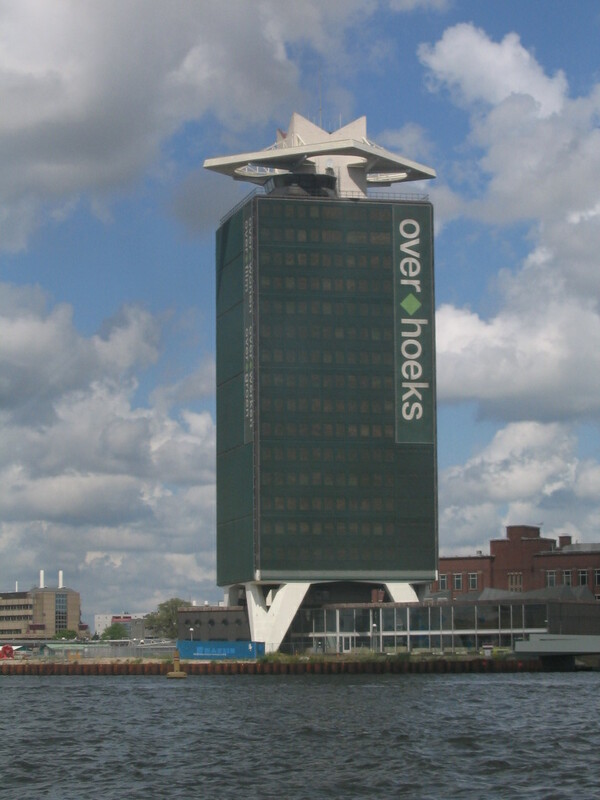 The Overhoeks area across the IJ to the north side, now also home to EYE. It seems like the tower is currently in transition. Catching some air and waves, looking and heading east toward the west end of Java-eiland (Java Island). 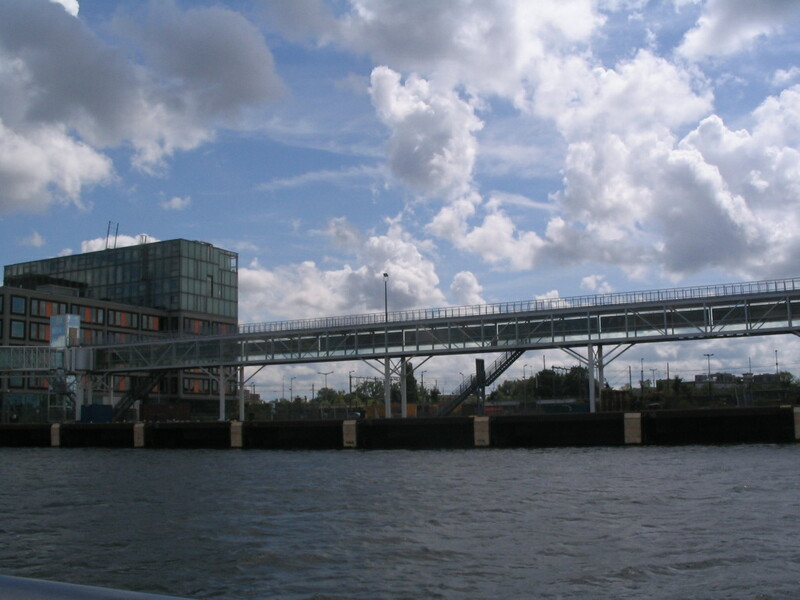 An intense footbridge, with both enclosed and open levels, along the south shore of the IJ, in the area near Veemkade (kade means quay or wharf). 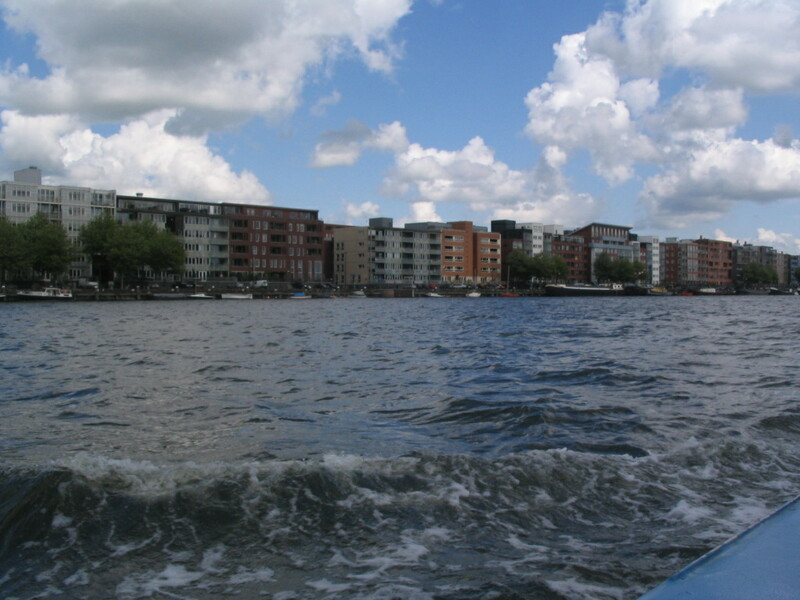 Java-eiland is a bar-shaped island recently redeveloped into housing. 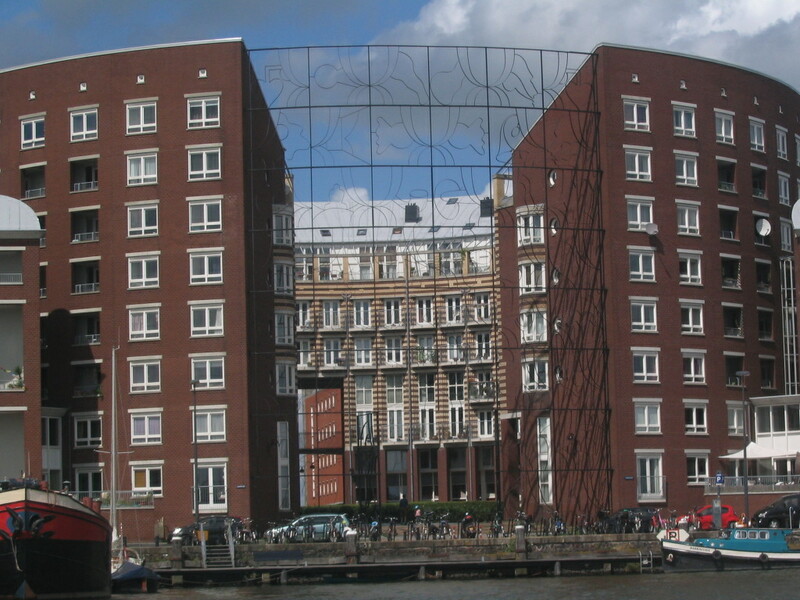 Near the east end of Java-eiland is this wild circular edifice with this wild ironwork screen. You can see clear through to the other side, just barely. 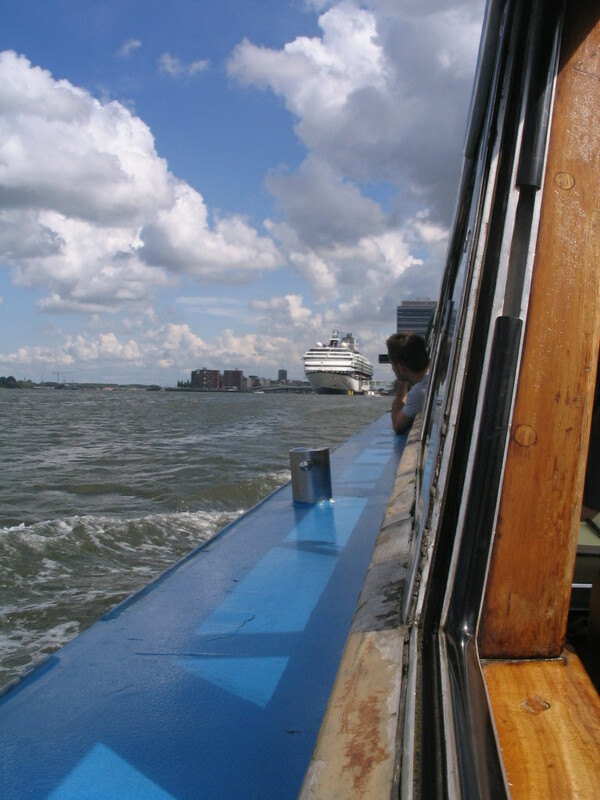 We turned south into the Zeeburg. 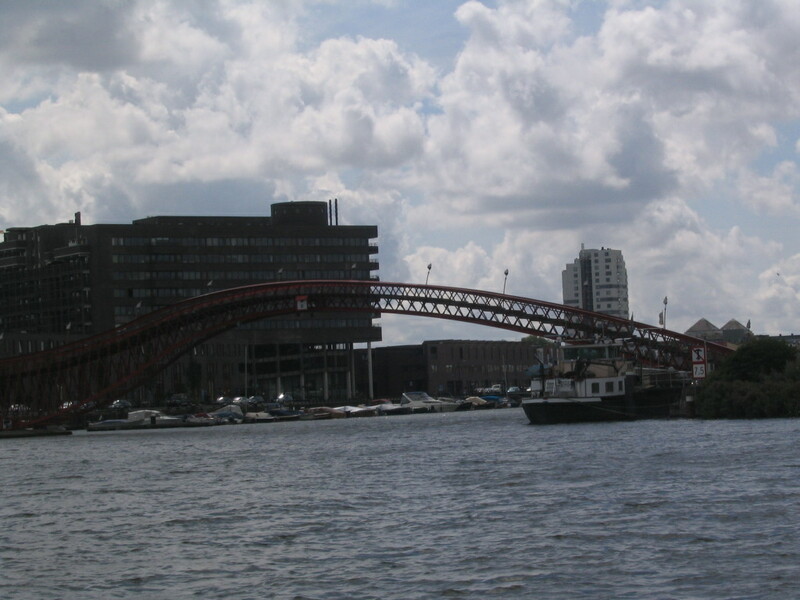 Here, the excellently named Pythonbrug (Python Bridge) arches over the Spoorwegbassin. 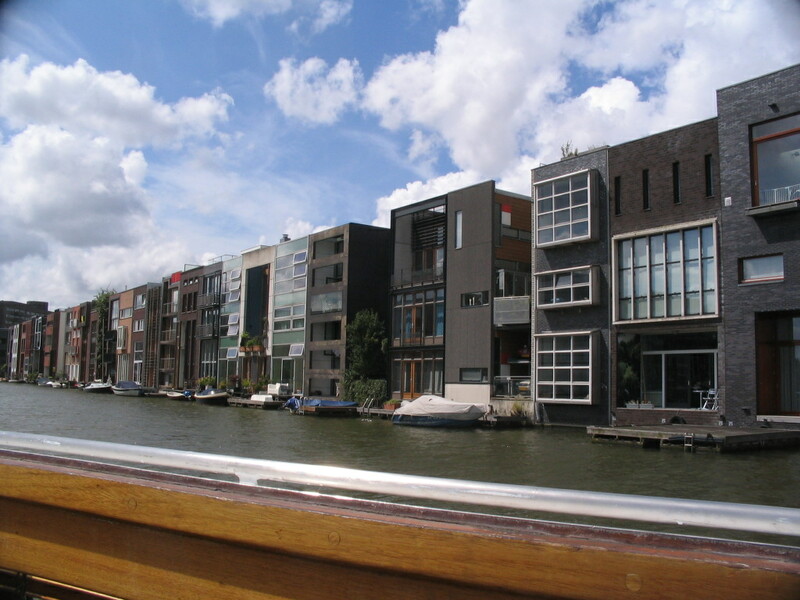 A nicely varied palette of individually austere houses, on the back side of the tongue-twisting Scheepschimmermanstraat. 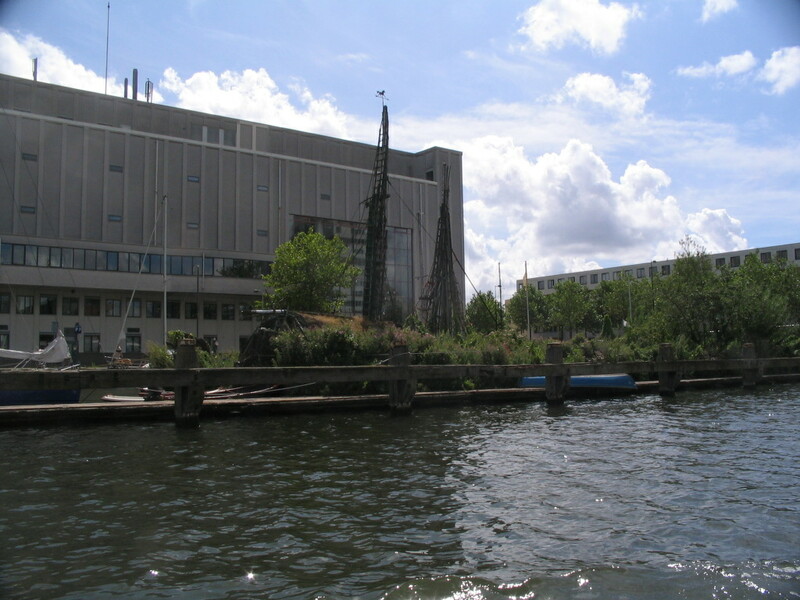 Looking over the Entrepothaven (Warehouse Harbor) toward some insistent horizontal rhythms along Zeeburgerkade. 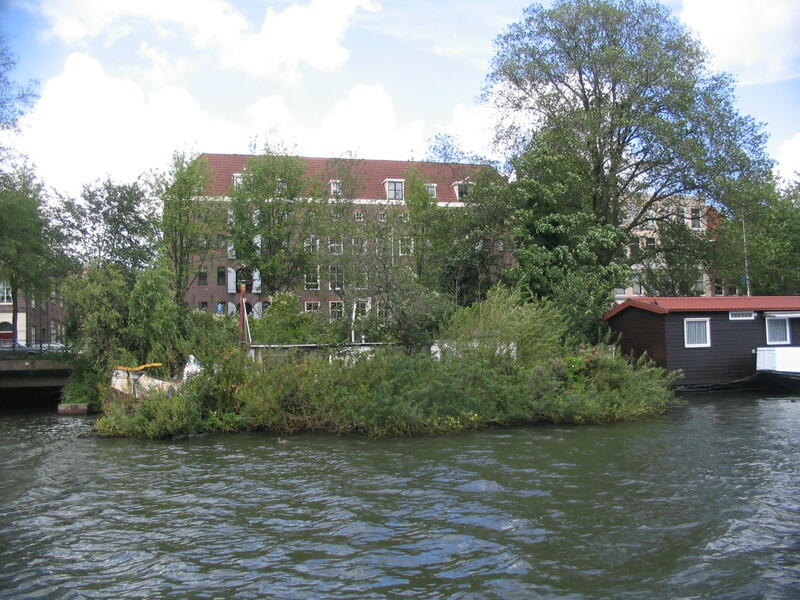 Near the inner end of the Entrepotshaven is this wicked overgrown platform, or maybe it's a houseboat even?? 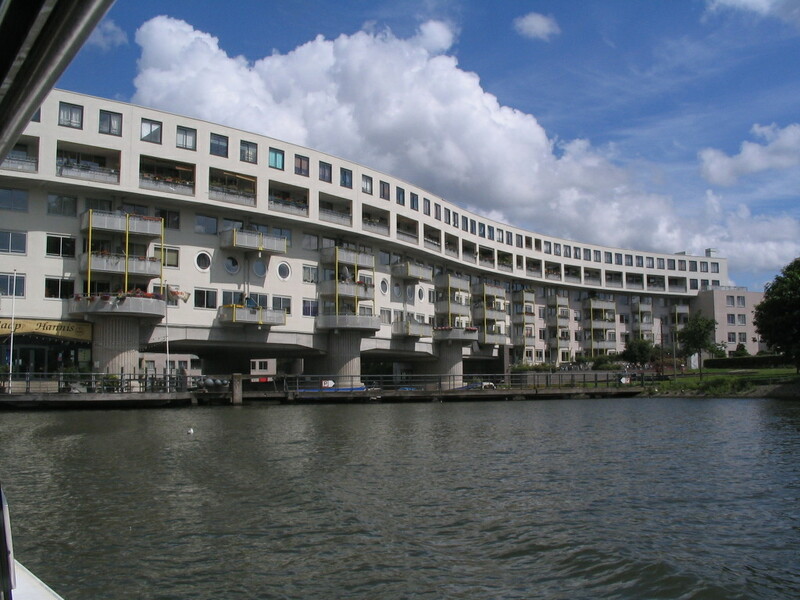 This wavy place straight-up crosses over the Entrepotshaven, just west of C. van Eesterenlaan. 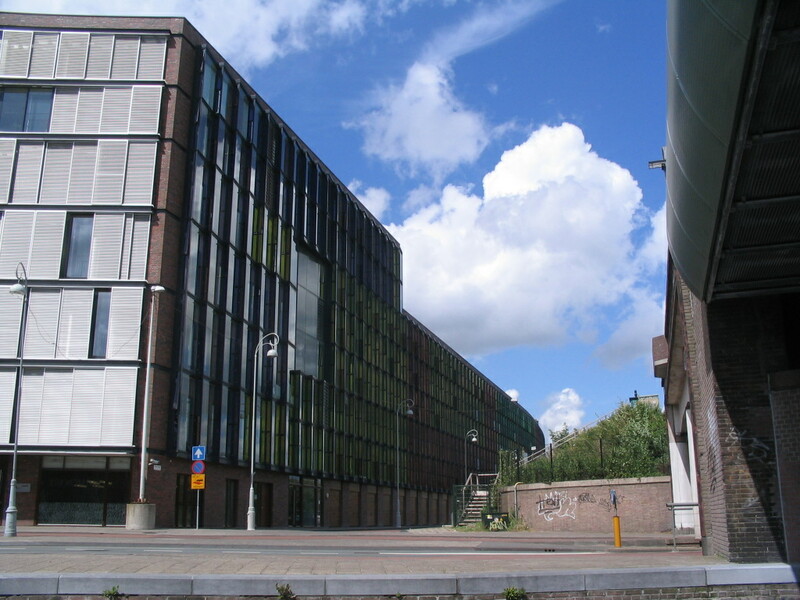 Note the colored glass slats on the receding façade at left, just barely visible in this light, looking up Keerwal west of the railroad bridge, along Cruquiuskade. 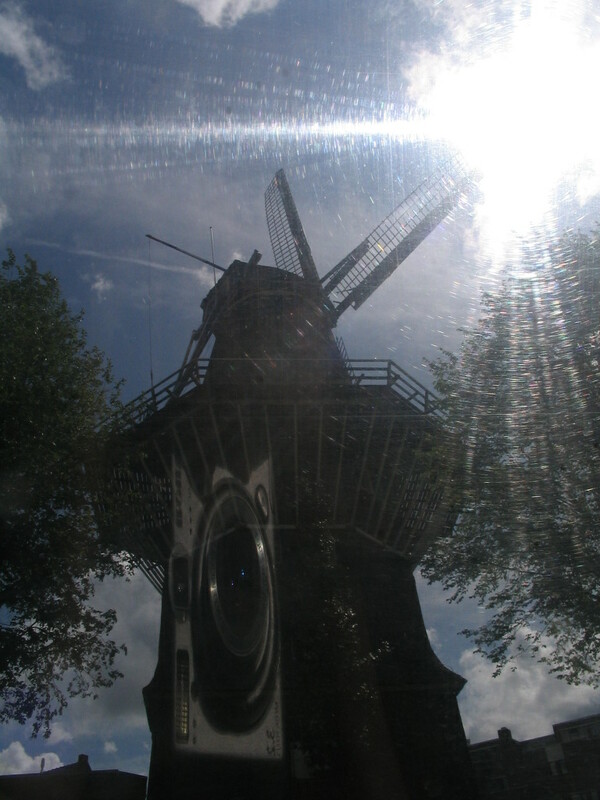 A solarified glimpse of the windmill De Gooyer as we proceeded from the Lozingskanaal into the Nieuwevaart, both of which are canals threading through the eastern part of the city. 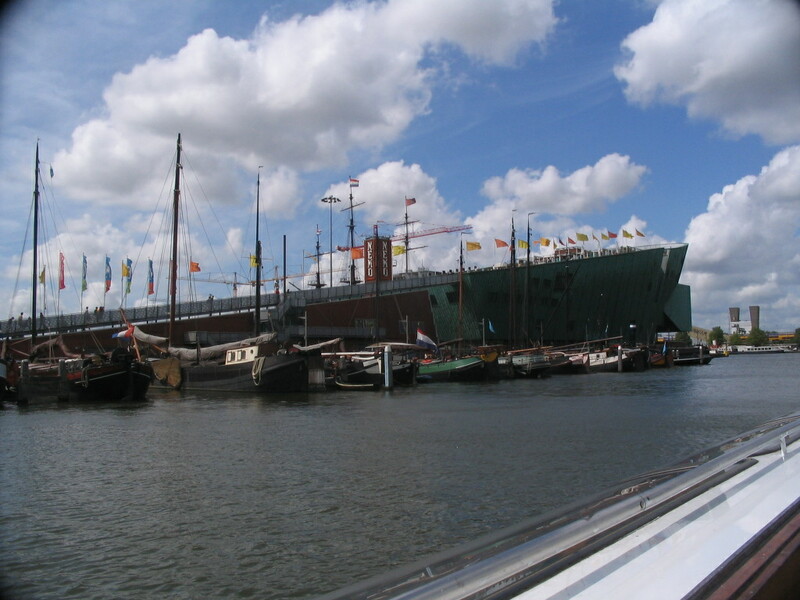 A shipping engine museum, it would appear, at the end of Kruithuisstraat, on the Nieuwevaart. 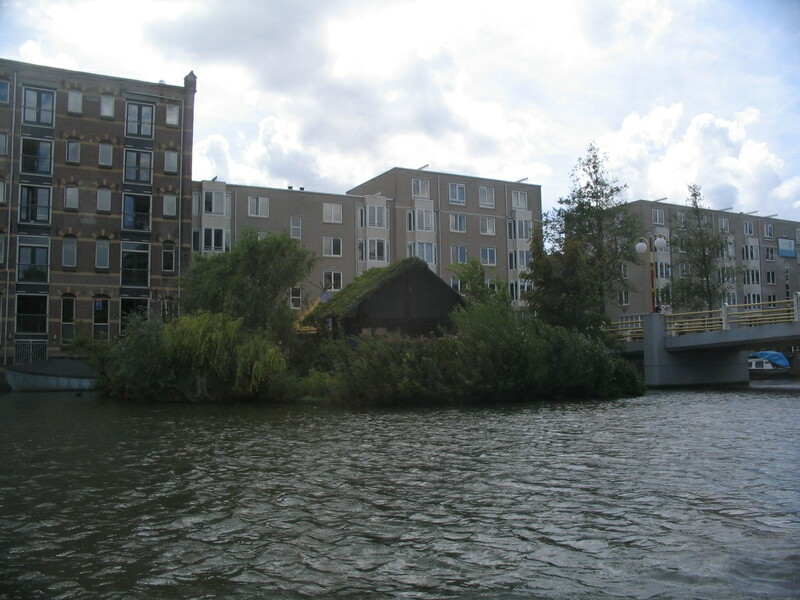 ...and west of that bridge on the north side of the Nieuwevaart. Tall people gotta watch themselves under these bridges. 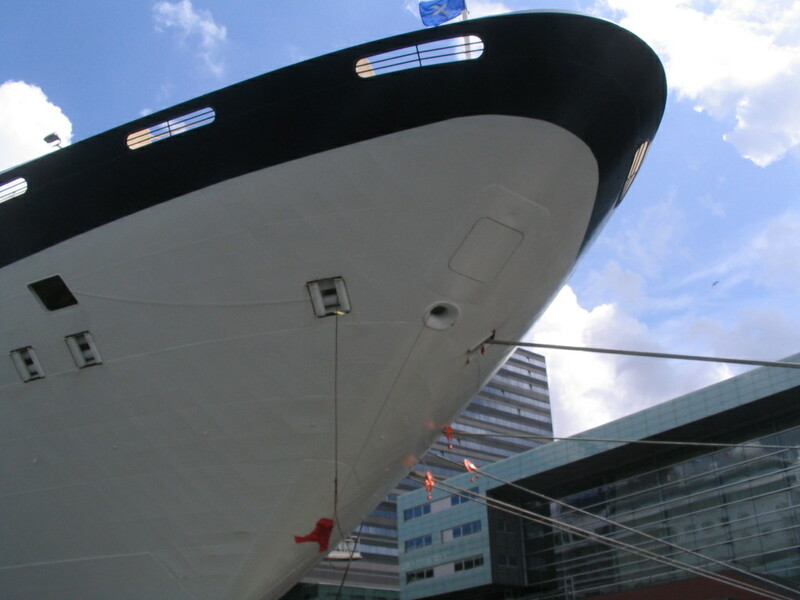 This is the Prins Hendrikkade bridge. 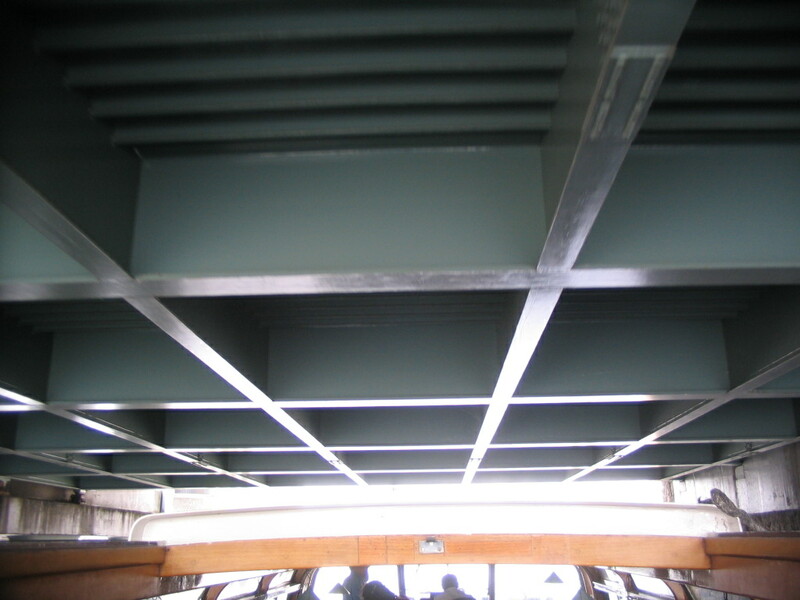 A lot of them have this nicely finished look to their support structures. 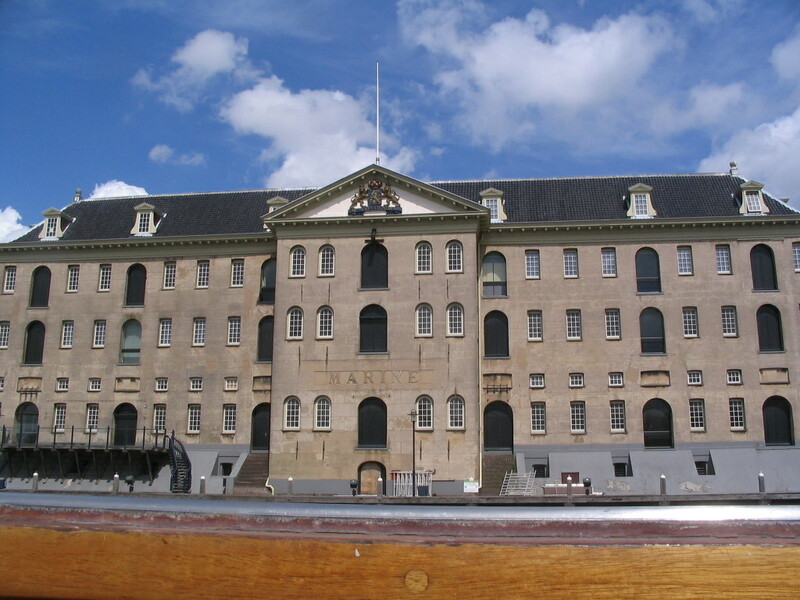 The imposing Scheepvaartmuseum (National Maritime Museum) at the western mouth of the Nieuwevaart. 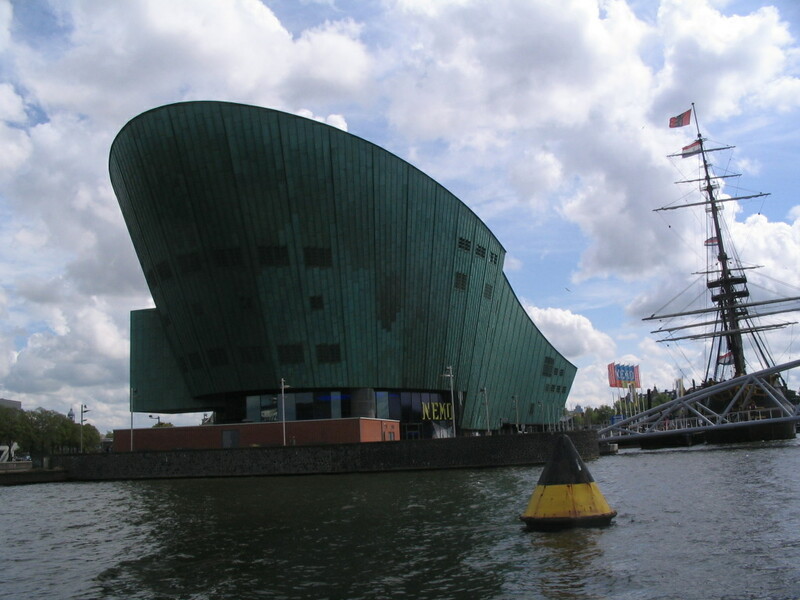 Across the way, the intriguing NEMO Science Center, also imposing but in quite a different manner. 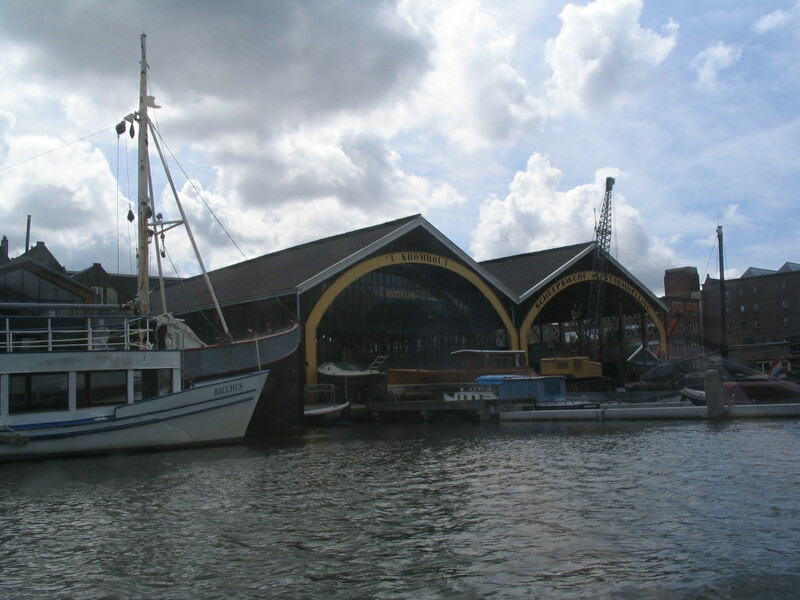 So let's see, that's a boat named NEMO and... a building shaped like a boat named NEMO. 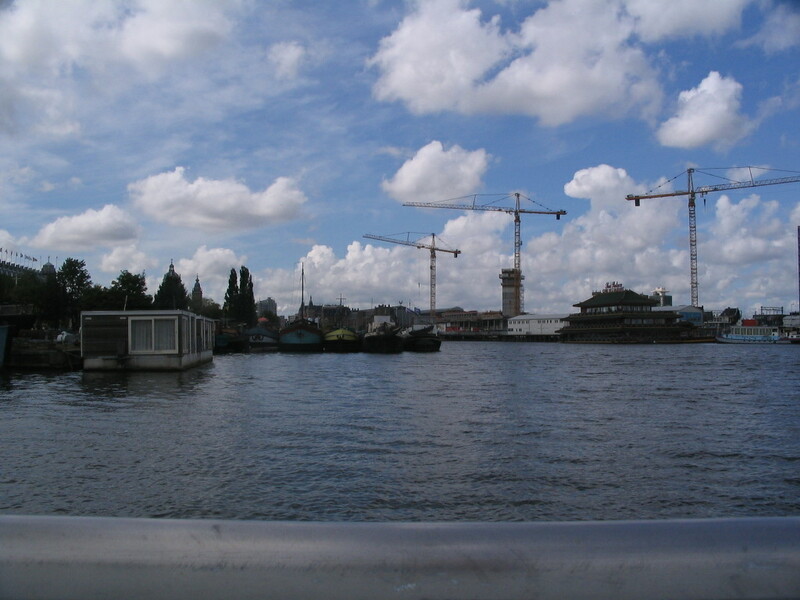 From the west side of NEMO, a look west over the Oosterdok toward the city center.